Is not messy like some gels - can be rubbed into the skin after treatment. 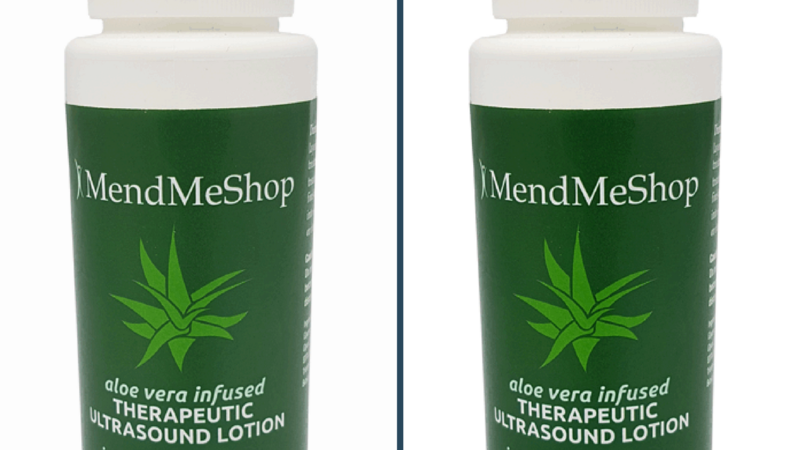 Today we have some great news - MendMeShop has a new Ultrasound Lotion we developed and are offering a special deal to 100 of our previous customers. Please note: you are able to purchase as much Ultrasound lotion as you want in your order - we are just limiting the offer to the first 100 people who repsond. If you are still seeing this page, that means the promotion is still active - so order soon! As mentioned in the email, this is a very limited time offer. If you are interested in trying our new Aloe Infused Ultrasound Lotion, we would suggest you take advantage of the deal sooner than later (and possibly miss out on the savings). Purchasing a single bottle of Aloe Infused Ultrasound Lotion at regular price would cost $32.00 ($18.50/bottle plus $13.50 shipping). We are offering you 2 bottles of the Ultrasound Lotion for $27 and we are covering the shipping costs! You will pay less for 2 bottles than you would purchasing 1 bottle at regular price. Aloe Vera been shown in research to provide anti-inflammatory benefits while providing a soothing effect to sore and damaged tissues. In addition, the phonophoresis effect of combining therapeutic ultrasound with an aloe infused conductive lotion can help reduce edema (swelling) and promote healing & strengthening of injured tissues (muscle, tendons, ligaments, and more). The Aloe Vera within our lotion is driven up to 4 inches below the skin into the underlying tissues. This gets the medicinal properties working for you where you need it: far below the skin and directly into your injured muscle, tendons, ligaments, and other tissues. The science behind the MendMeShop Ultrasound Lotion is what makes this product unique. Its ability to effectively penetrate deep into the body is the result of an intense effort to combine key ingredients using a precise formula. Not only do the ingredients need a proven efficacy, but they also have to have the right molecular size to permeate the skin. As well, the medicinal molecule can't react with the ultrasound gel. It must also be able to survive the thermal and vibrational effects of the ultrasound wave. The delivery of medicinal properties via ultrasound is truly a science unto its own. Made in Canada at an FDA registered AND Health Canada approved manufacturing facility, you can be assured that our Aloe Infused Ultrasound Lotion is safe and effective. Expect the same high quality that MendMeShop customers have been accustomed to since 2005. We've kept out all the bad ingredients (paraben, colorants, industrial dyes), and we can honestly say - it was a challenge to develop! Our decision NOT to use the standard industrial aloe additive but to use REAL Aloe Vera is a decision made for this reason: MendMeShop is about Real Solutions for Real People. Why an ultrasound lotion and not a gel? To begin, our lotion is not messy and sticky like some gels are. Plus, some gels become runny after exposure to different temperatures and the closer they get to the expiration date, the more the texture can change in the gel. An Ultrasound lotion has more consistency in texture. With an ultrasound lotion, it is easier to apply and allows one to achieve more even coverage. Best of all - you can massage the excess lotion into your skin after a treatment. The Aloe Vera has a very soothing and calming effect! You do not need to wipe the excess lotion off the body like you do when using a traditional ultrasound gel. But most importantly, the soundwave conductivity results between ultrasound lotion and ultrasound gel are very similar. You will retain all the benefits of ultrasound treatments using an ultrasound lotion. There is a reason why high-end therapy clinics choose to use an ultrasound lotion instead of a gel - because their clients insist on nothing but the best. And the best is what we want to provide to our customers. Place your order today to receive a significant savings over the regular price. Each bottle is a standard 8 ounce size containing enough ultrasound lotion for approximately 45 applications. This is definitely a good time to stock up on ultrasound gel ahead of the summer injury season. You may pre-order online (on this very page) or by calling us toll free 1-866-237-9608 to place an order over the phone. We are available on weekdays between 9:00 am and 5:00 pm Eastern Time on weekdays. Your order will be processed and shipped very quickly. All orders are sent Priority Mail, with delivery within 2 or 3 business days. Rotator Cuff Injuries: Supraspinatus / Infraspinatus / etc. I used the Aloe Infused Ultrasound Lotion on my ankle and really like it. Has nice scent and the opening is much better, more efficient. The lotion itself is easy to apply and not sticky feeling so I really did not have to wash it off.